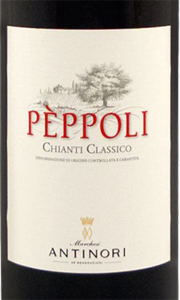 The Chianti Classico DOCG, Tenuta Peppoli, by Antinori comes from the typical grape varieties of the area that are grown in about 50 hectares. Complex wine, well structured with a fruity character and full of aromas. Sangiovese fruity and full of vitality matured both in French oak barrels and in American oak barrels. 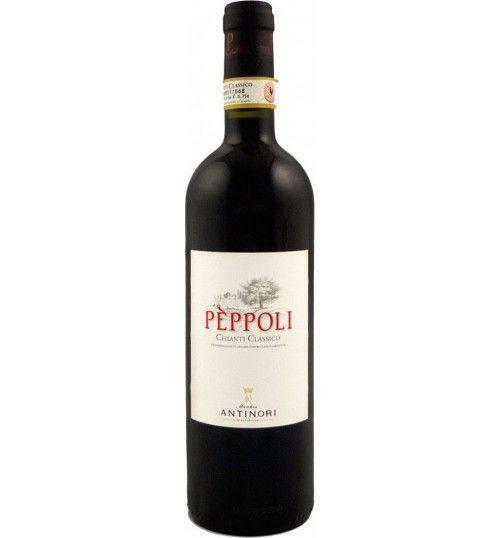 THE WINE The Chianti Classico DOCG , Tenuta Peppoli , by Antinori comes from the typical grape varieties of the area that are grown in about 50 hectares. Complex wine, well structured with a fruity character and full of aromas. Sangiovese fruity and full of vitality matured both in French oak barrels and in American oak barrels. 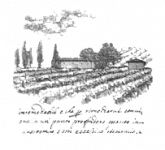 The Pèppoli estate is located five kilometers (three miles) to the northeast of the Tignanello estate and extends over a total surface area of100 hectares (250 acres), 50 of which (125 acres) are planted to vines which produce the Peppoli Chianti Classico, an appellation controlled wine. The vineyards face east-northeast and, despite this unusual position and exposure, are situated in an ideal micro-climate; they are located, in fact, in a small valley which maintains warmth and on mineral-rich rocky soils, perfect for the production of a fruity and lively Sangiovese. The Pèppoli vineyards consist principally of Sangiovese, although there is some Merlot and Syrah and a small amount of Malvasia as well. THE COMPANY The Antinori family has been making wine for over six hundred years when, in 1385, Giovanni di Piero Antinori became part dell 'Arte Fiorentina dei Vinattieri. Throughout its long history, spanning 26 generations, the family has always personally managed the business making innovative, sometimes courageous choices, always with unwavering respect for tradition and for the territory. Today the company is headed by Albiera Antinori, with the support of the two sisters Allegra and Alessia, personally involved in the business activities. Marchese Piero Antinori is currently the Honorary President of the company. Tradition, passion and instinct have been the driving qualities that have led Marchesi Antinori to establish itself as one of the leading Italian wine producers. Every vintage, every terroir, every idea you want to put in place is a new beginning, a new quest to raise our quality margins. As Marchese Piero loves to repeat: "ancient roots play an important role in our philosophy, but they have never held back our innovative spirit." The estates of Tuscany and Umbria, historical heritage of the family, have been added with the time investment in other areas suitable for the production of quality wines both in Italy and abroad, where they could embark on a new path of exploitation of new " terroir "high production potential. Marchesi Antinori expresses his passion for winemaking looking for improvement increasingly thin. Why increases in continuous experiments in the vineyards and cellars with selections of native and international clones of grapes, types of crops, vineyard altitudes, fermentation methods and temperatures, traditional and modern vinification techniques, different types of timber size and age of barrels , and varying the length of refining in the bottle. "We have shown over the years that in Tuscany and Umbria it was possible to produce quality wines, recognized internationally, they could show elegance and refinement while maintaining the character originario.La Our library has many titles, but for us is not rich enough. We have a mission that is not fully accomplished, which pushes us to express the vast potential of our vineyards and reconcile again remains to be discovered with the heritage of the Tuscan taste that includes traditional, culture, agriculture, 'artistic and literary These things represent the identity of the Marchesi Antinori, one of the greatest strengths lies in the fact of being Tuscan, or if you prefer, our' Tuscan '. " Piero Antinori The Antinori family is part, since its foundation, the PFV, "Premum Familiae Vini", an informal association of wineries owned by a family. PFV goes beyond geographical borders and keeps a common bond: that of the vineyards properties and the production of wine as a family business to grow and improve, like a fine wine, over time. Before 22,29 € tax incl. Tasting Color: ruby red. Bouquet: cherry and raspberry notes; shades of violet and vanilla berries. Taste: balanced and tasty, with good acidity. Fruity and spicy aftertaste, soft tannins and a persistent finish. The Pèppoli estate is located five kilometers (three miles) to the northeast of the Tignanello estate and extends over a total surface area of100 hectares (250 acres), 50 of which (125 acres) are planted to vines which produce the Peppoli Chianti Classico, an appellation controlled wine. The vineyards face east-northeast and, despite this unusual position and exposure, are situated in an ideal micro-climate; they are located, in fact, in a small valley which maintains warmth and on mineral-rich rocky soils, perfect for the production of a fruity and lively Sangiovese. The Pèppoli vineyards consist principally of Sangiovese, although there is some Merlot and Syrah and a small amount of Malvasia as well.